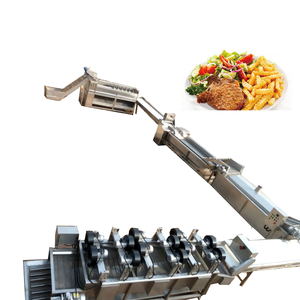 Semi-automatic Small Scale French Fries /Potato Chips Production Line with 50-100Kgs/hour Introduction of French Fries /Potato Chips Production Line 1. Potato peeling and washing machine: peeling and washing the potato, with high efficient and low consumption; 2. Potato cutter: cut potato into slice or stick shape, both of shape and thickness can be adjusted according to client&rsquo;s requirement; 3. Blanching machine: can rinsing and protect color of the potato chips; 4. Dehydrator machine: use the centrifugal dehydration, reduce drying time, and improve the taste of potato chips; 5. 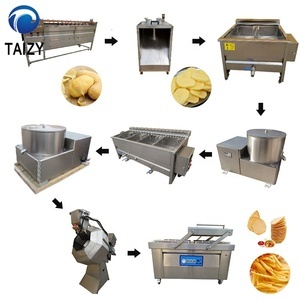 Frying machine: fry the potato, make potato chips tasty; 6. Deoiling machine: remove extra oil; 7. Flavor machine: by rotating, spray seasoning on the potato chips, keep no broken; 8. Vacuum package machine: packing the potato chips with nitrogen. Final Product: French Fries /Potato Chips Packaging & Shipping Packaging: Wooden Crate or Pallet or bare package in standard containers for export; Package sample: Shipping: All machines will be sent by sea, if you need other kind of transportation, please inform us in advance. Before and after shipping, we will take photos of machines and send photos to client. 3.About Shipping: We can be responsible for the shipping,of course,we can also accept and cooperate with your agent if you have shipping forwarder in China. The of machine Q1: What is your machine guarantee9 A1: Usually the guarantee period is for 1 year, and we will keep contact with our customers for after-sales service. It is also depend on the machine itself, if you place order with us, and need to customize the machine as your requirement, the producing time is longer. The motor is good quality national standard copper core motor, which is long time service. 2. Advanced engineers and designer ensure every machine is in reasonable structure and delicate appearance. Service: 1. For the single machine,we will provide proper model according to customers requirement. a, Before sending the machine, we will test and adjust, so you can use directly when you get it. b, Operation video & instruction will be sent to clients, to help them use the machines better. If you are caught in some problems when using our products, welcome to contact us at any time. Overview of the Potato Chips Production Line This is fully automatic production line to produce potato chips from fresh potatoes. For the 100-150kg/h potato chips line: The length of the entire production line is 50 meters. The packing machine is an automatic one, and the machine can feed, elevate, weigh and pack the chips at one time. With ultrasonically welded center guide Ultrasonically welded Side wall and lateral cleats as per customer requirements. With ultrasonically welded center guide Ultrasonically welded Side wall and lateral cleats as per customer requirements. If you need more specific information on potato chips production line replacement parts, contact me freely for potato chips production line replacement parts. Shanghai HG Food Machinery Co., Ltd.
Zhucheng Yifu Machinery Co., Ltd.
2. It is more convenient to operat e , adjustable and low broken rate, reduce s labor time but raise s output. 3, We have rich experience on frozen french fries production line. Now our line has been installed in KSA, Algeria, tunis, Morocco, Zambia and so on. &diams; Advanced temperature control device and reasonable stirring device ensure the best frying quality. &diams; Dynamic oil filter system cleans the waste residue and keeps oil fresh during frying. We not only offer complete production line for you, but also offer single machine to meet your requirements. The line mainly include the process of potato washing peeling,cutting,washing,blanching,dewatering,frying,deoiling,flavoringand packing. We will provide formula and technology guidence free of charge to make sure you can make high quality and delicious potato chips. Zhengzhou Qixin has a team consists of highly experienced technical staff that meet every kind of manufacturing tasks. &diams; One year warranty time From the date which the product is qualified Any damage except the wrong operation during warranty period is repaired freely. Q1: What is your machine guarantee9 A1: Normally the guarantee period is 1 year, and we will keep contact with our customers for after-sales service. It is also depend on the machines, if need to customize the machine as your requirement, the producing time is longer. 2. This Lays Potato Chips Making Machine Price also can be adjusted to produce potato chips. &diams; Online/Sale service : 1.super and solid quality 2.fast and punctual delivery 3.standard export package or as customers' need. &diams; After-sale service : 1.Assistance to build factory or ur project 2.Repairing and maintenance if any problem occur in the warranty . Alibaba.com offers 2,310 fully automatic potato chips production line products. About 1% of these are other food processing machinery, 1% are brick making machinery, and 1% are packaging line. 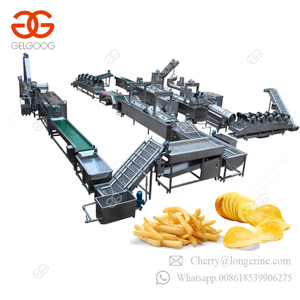 A wide variety of fully automatic potato chips production line options are available to you, such as free samples, paid samples. There are 2,312 fully automatic potato chips production line suppliers, mainly located in Asia. The top supplying countries are China (Mainland), India, and Ukraine, which supply 99%, 1%, and 1% of fully automatic potato chips production line respectively. 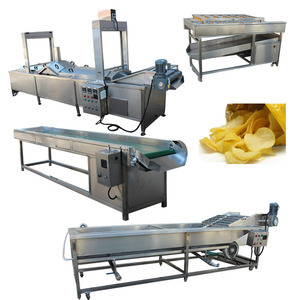 Fully automatic potato chips production line products are most popular in Africa, Domestic Market, and Southeast Asia. You can ensure product safety by selecting from certified suppliers, including 373 with ISO9001, 290 with Other, and 107 with ISO14001 certification.